Someone once said that if you’re eating a selection of foods that span the color of the rainbow, then you’re probably eating healthy. That person was wickedly wise. I’m a salad freak, and I like to make my salads as colorful as possible with added tomatoes, avocado, red kidney beans, garbanzo beans, berries, feta cheese, cucumber, bell peppers… you name it, and I’ll put it in my salad. I also happen to love my vegetables. There’s rarely a vegetable I won’t try, and I enthusiastically enjoy most everything. Pickled vegetables are terrific too, my favorite being Bread and Butter Pickles and Green Beans. 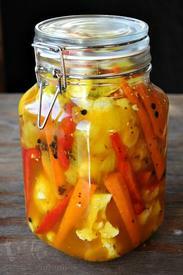 Today I’ve Pickled Cauliflower with an added bonus of red bell peppers and carrots.